ANSI pressure classes 300, 400, 600, 900, 1200 and 1500. Split repair clamps WA-SBC repair units, bolt closed around leaks in a pipe section. WA-SBC high pressure leak repair clamps may be installed on oil, gas, steam, water and chemical pipelines. View complete ANSI Table Chart, working class by pressure. Repair Clamp seals may be NBR or VITON or other seals compatible with the pipeline fluid and operating temperature. 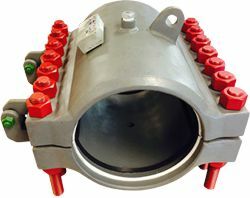 WA-SBC repair clamps are hydrostatically tested to 1.3 times the rated working pressure (as per ASME Section VIII Div.1 clause UG-99) All Clamps are equipped with a 1” NPT vent port. Seals may be replaceable without special tools. WA-SBC Girder split clamps are suitable for high temperatures applications with pipe operational pressures up to 3700 psi. 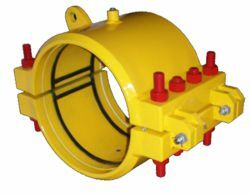 Split Repair Sleeves can be equipped with hinge plates and lifting eyes to simplify field installation. Seals are firmly kept in place with steel girder rings. Hydrostatic test certificates are supplied with each delivery. Repair Clamps elbow design - high pressure units. 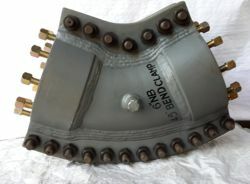 WA-BC bend repair clamps: are used to repair pipeline bends and elbows. Higher friction between the fluid and pipe wall normally occurs at pipe bends. Elbows are identified by curve, angle or radius definition. Elbow repair clamps are used to repair may be used most pipe sizes with high or low operational pressures. Split repair elbow clamp halves are closed by bolts to form a high integrity pressure seal around the damaged or leaking pipe section. Elbow repair clamps may be installed without shutting down the pipe line. Elbow repair clamps of various angles may be repaired. 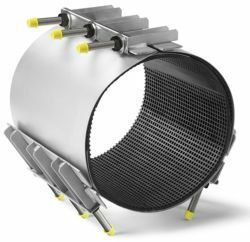 Sealing is provided by elastomeric seals selected for compatibility with the pipeline fluid and temperature. 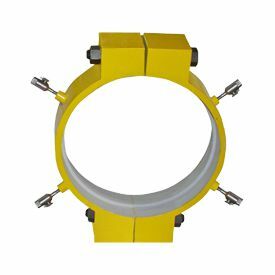 Split repair clamps elbow design are manufactured to the outer dimension of the elbows, they offer the best solution for pipe angle repair. Elbow leaks or weak or damaged elbow repair clamps are a solution for repairs at these vulnerable sections of the pipeline. Elbow repair clamps are designed for ANSI Pressure classes 300-1500#. Design based on API 6H. Design calculation ASME Sec. VIII Div. I. No special flange surface preparation is required. The line remains in service during installation, no costly shutdowns. 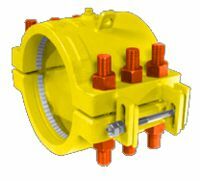 Flange repair clamps can be installed by company maintenance personnel. There is no altering of existing flanges, other than cleaning the flange. On scheduled shutdown maintenance the flange repair clamp can be removed and the gasket replaced. The unit may put back in service or held in stores for future repair. 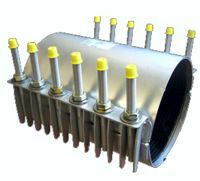 Injection sockets are utilized to fully seal the compartment. In case of a small gap between the line flanges, gaskets can be installed for temporarily sealing prior too and during injection. Download fill-in form for flange repair clamp: return form to Westatlantic Tech Corp.
Repair clamps WA-RH stainless steel units repair leaking pipes with operational pressures up to 16 bars - 235 psi. Available with NBR and Viton seals. Fits all america and international pipe sizes. All metal parts: stainless steel AISI 304 or AISI316L. 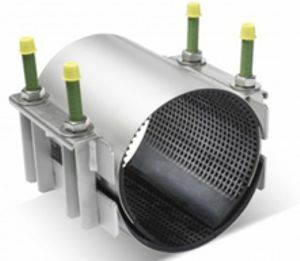 Double band (two sections) with a working range of 20-22 mm depending on the diameter. V gasket, steel reinforced to form the pressure chamber. Bridge plates are vulcanized into the rubber gasket. Bolts are PTFE (Teflon™) coated to prevent galling. Under most circumstances the clamps can be installed. without releasing the pressure on the pipe. application and restrictions on these pipe types. 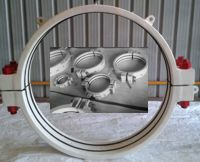 repair clamps, split, bolted, bolted repair clamps, flange repair clamps, flange leak repair clamps. USA and Canada, USA: Texas, TX, Houston, New York, NY, Illinois, IL, North Dakota, ND, Iowa, IA, Ohio, OH, Michigan, New York, NY, Utah, Arkansas, Kentucky, KC, California, CA, Colorado, Denver, Louisiana, LA, Florida, FL., Pennsylvania, PA. Wisconsin, WI. Canada, Ontario, Oakville, Toronto, London, Hamilton, Mississauga. Alberta, AB; Edmonton, Fort McMurray Calgary. British Colombia, BC; Kelowna, Vancouver, Prince Rupert, Kitimat. Saskatchewan, SK; Regina, Saskatoon, Prince Albert, Esrevan, Swift Current. Manitoba MB; Winnipeg, Thompson. Quebec, QC; Montreal, Quebec City, Trois-Rieviers, Chebougamau, Sherbrooke. QC, Alberta, Saskatchewan, Manitoba, Quebec, New Brunswick, NS, newfoundland.